I have never really been able to get into the online shopping as much since I like to go to the store look at stuff try it out and hate dealing with the whole exchange refund sending back process that goes along with online shopping. With that said I know that you can also get a good deal on items online and free shipping as well. What is your favorite trustworthy baby gear website? FTM, I'm sort of winging it between walking through Buy Buy Baby and reading up on websites like Consumer Reports and NightLight, then actually registering on Amazon.com. Sometimes I find things cheaper on other websites, and I just do the Universal Registry option to list the things on our Amazon registry but have the link go to the cheaper websites. I'm a big fan of Amazon and Target. Personally, I find BBB and BRU to be overpriced. I probably should have been more specific, I also find BBB and BRU to be overpriced as well. I will also price check amazon and Target as well. But I've heard of people say they have gone to certain websites where they may find last years model of a stroller or furniture at a cheaper price. I just never paid attention to what those sites are which is why I figured I would ask here. Im in search of a double stroller but don't want to really shell out the $600 + dollars if I can help it. Not a website, but I found in my local area there are several baby consignment warehouse sales during the year. I found an older but lightly used model stroller there for a good discounted price. It would be worthseeing if there are some in your local area. Amazon prime all the way for me. Free returns and I can occasionally find a deal where they reduce the price even though the product is new because of a damaged box. Saved a bunch on my first stroller because of it. Check Craigslist or eBay, a girl in my other mom group got a city select on eBay for like 200! Also baby trend has a modern looking (if that matters) double stroller for a good price, it's a target! You should check out your local buy, sell, trade groups on Facebook. You can find some really great deals. Also second Craigslist. We got our son's dresser from there and my mom got our crib plus brand new mattress from Craigslist for $250. It would've retailed for $700. I know that as a FTM you'll want to mostly get things that are new, but don't be afraid of secondhand items. You'll be amazed at how quickly your kid will grow out of those expensive items. @CanadianintheSouth How do you find the "damaged box" deals on Amazon Prime?! I want in! Amazon... overall seems to have the best prices/most reviews. I haven't shared our registry with people yet but it's all on Amazon. We have Prime too & they do the same completion discount most stores offer so I might hold off until after baby arrives to buy some things to take advantage of that (or just move up my estimated due date on Amazon if that's possible/not too shady). However the stroller I want is cheaper at Buy Buy Baby after applying a 20% coupon so for bigger ticket items I'm gonna shop around even more and compare (and use coupons) before I buy. Also hoping for some deals on Cyber Monday or Black Friday with Target & Kohls. +1 for Amazon. And with my credit card, I can accumulate points to then use towards my purchases on Amazon. I've gotten a lot of stuff for free by just using my accumulated points. Our rainbow baby after two losses. Rest sweetly, my angels. 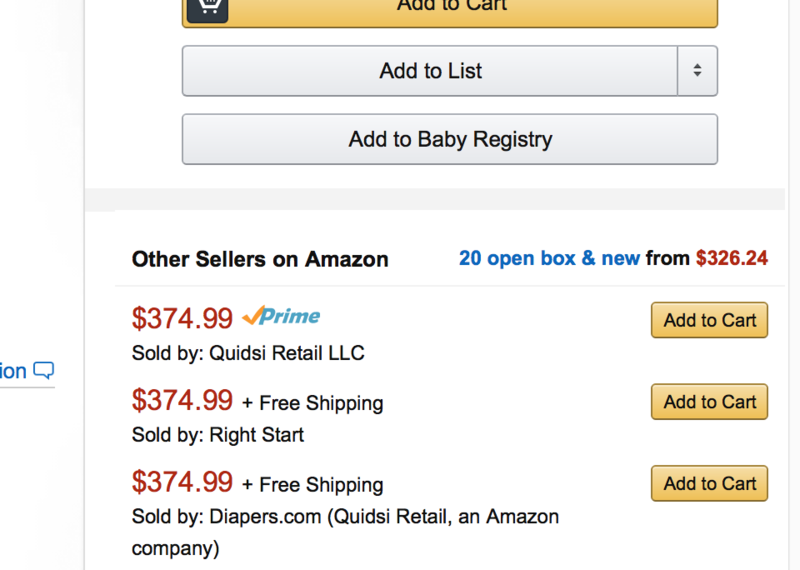 I ended up registering on Babylist - when you register an item, it gives a few prices on a few different websites for people to choose from and keeps the prices updated if sales go on - so if someone has amazon prime they can shop from there, even if you added the items from Target or elsewhere. My registry is kind of lean though, having a very small "sprinkle" instead of a shower so most stuff I plan to get myself, so not sure if this site would work for a full on registry. But I had put a few things from Etsy, and a few other sites that don't have registry options, so it will work well for me. I love Amazon because I find the reviews are really thorough. I agree with others who said prices are usually cheapest on Amazon too! Thanks for all the tips ladies. @jenny0228 I'll have to give babylist a look as I like the idea of it giving you a few different prices from different websites. Amazon prime because I'm lazy. I'm trying to avoid baby shopping & be relatively frugal. Let me tell you, it's impossible! I've only purchased one footie thing and one onesie that I couldn't pass up. BabyGap has great items on clearance (both of mine under $4), and you can use coupon codes etc. So soft & so sweet. Babycheapskate.com is a great place to bookmark and check in to... she posts really good deals from all over the web. Especially with baby clothes and stuff I almost never buy full price, I keep an eye out there for deals at Old Navy/Baby Gap/Carters/etc. Can I just say Latched Mama has a labor dress that I am in love with? I'm trying to convince my husband to let me buy it. It's seriously under 40 bucks. He keeps reminding me that I just took all my clothes off last time and it would be a waste of money if I do it again, lol. got it from pishposhbaby.com. I went to buy buy baby to them then i turn to the internet for the best price. Most websites offer free shipping. I'm also a big Amazon shopper and watch deals from baby cheapskates and daily dose of pink rose mama. Both post internet deals they find. I worship Amazon Prime. Even if you like to go to the store to look at things and try them out... While you're there, pull up Amazon on your phone and scan the barcode on whatever it is you're looking at. Guaranteed that you will save money. I did it last week with a car seat base. $55 at Babies R Us, $38 on Amazon. Sold. Also, we are pretty much stocked up on the entire first year of baby clothes. Some were given to us by my co-workers. But, H follows a bunch of online local yard sale groups on Facebook. He hit the jackpot the other day. Literally a trash bag full of brand name, great quality baby clothes for $50. When the lady heard that my due date is her son's birthday, she started throwing in more clothes for no additional charge.